I have written before on the subject of Alzheimer’s, the Deadly disease. Many of us have suffered with our parents, mother or father, as they struggle through this journey. We have watched them change from the lively, spirited, strong people they once were to this shell of themselves, trying to make sense of who and where they are. I wrote about a few days in April 2016 when, following a major misadventure, for a few days I didn’t know who or where I was. I mistook my son for a doctor and didn’t recognise my grandsons. But luckily for me, it was only a few days. For that short time, I could bond with my fictional character Jane and those people who are living with this full time. One such person, and someone I have written about before, is Wendy Mitchell. Wendy says “On the 31st July 2014 I was diagnosed with Young onset dementia. I may not have much of a short-term memory anymore but that date is one I’ll never forget.” Wendy was only 62 with a busy full life ahead of her. Please go over to her site to read more about this fantastic woman. She is living with dementia every day of her life, and is filling it with activity not only to help herself but to help others too. She is active on various organisations, has written a book and writes a blog post daily. Tove’s mother was diagnosed with Alzheimer’s at 56 and sadly died at 64. But she was a poet and before that ability was taken from her, she wrote several poems. With Wendy’s approval and I trust Tove’s as well, I am sharing two of the poems with you. Often, in the face of this or any disease or a terminal illness, we tend to forget the other people who are also affected – Wendy’s two daughters, Tove and many others are suffering along with the sufferers of the disease. They need our support, a phone call, a letter or a visit to show they are not forgotten; their suffering is acknowledged. I have enjoyed following Tara at Thin Spiral Notebook for several years. She is a writer of fiction, an artist, photographer and so much more. She is an inspiration. And I particularly like her 100 Word Challenge. Each week Tara sets a challenge and this week’s challenge is –Using the idea of age for inspiration, write 100 Words – 100 exactly – no more, no less. You can either use the word – or any form of the word – as one of your 100, or it can be implied. If you’d like to play along click on the ink. Thinking back over a long and mostly happy life I say I have lived a blessed life. Unfortunately, I have outlived my Dashing Young Scotsman and The Architect neither of whom got to be my age. And when younger people seem to be amazed that I am still enjoying myself at this vast age I tell them that I still have family and friends with whom to enjoy myself. And I have a suitcase of memories to look back on and remember the highlights, and a couple of not so highlights. 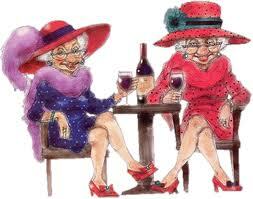 But I am glad I have reached this age. I have given up on playing catch up and have decided just to complete the assignments in my own time. i have just received from Amazon the book “Loving Frank” based on the lives and love story of Frank Lloyd Wright and Mamah Borthwick Cheney. I have been intrigued by the architect for some years and this has been fed upon by my now living with an architect whose inspiration has often been Frank Lloyd Wright. I recently met Mrs Cheney when she came into the shop to purchase a hat and later found out that the hat was for you. I am now aware that you two are cohabiting outside the marriage union and I must place on record my objection to your flouting the common courtesy rules of our society, not to mention the precepts of the Church. I strongly recommend that you send Mrs Cheney back to Mr Cheney and her children without delay. No you may not call me Frank. Mrs Cheney and I are living in a loving relationship that doesn’t impinge on your world and should not impinge on your conscience. The fact that you chose to write to me in this fashion deeply offends me. If Mrs Cheney and I choose to ignore the rules of society and those of your Church it is our own business. We do not intend to bow to your request. Mrs Cheney will now stay with me and we look forward to many years of being together, married or not. Note – I like this challenge and I may continue with this exchange of letters. Maybe there is another challenge where I can use this. Well it was a better start to this day. After a long, lovely chat on Skype to my partner I was able to have a hot shower. Oh joy and the hair was washed to. So I sallied forth feeling like a new woman. 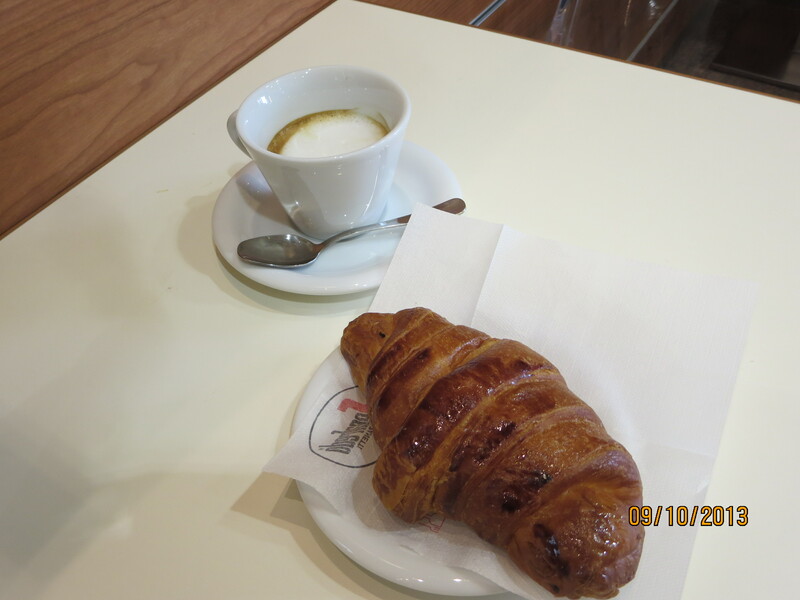 The first stop was the passticerria for macchiato and brioche then onto the bus into town. 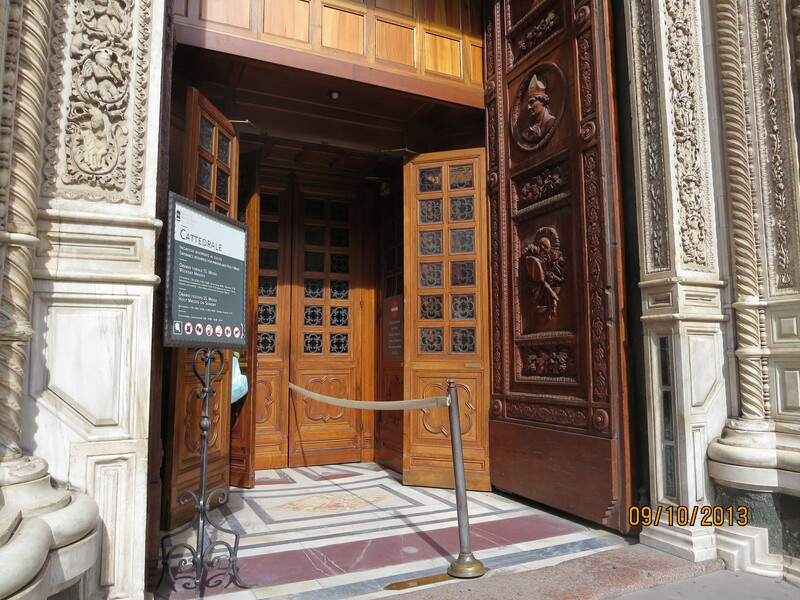 Here I discovered that the reason I was not able to go up into the Dome or down into the Crypt yesterday was because I was in the wrong Cathedral. 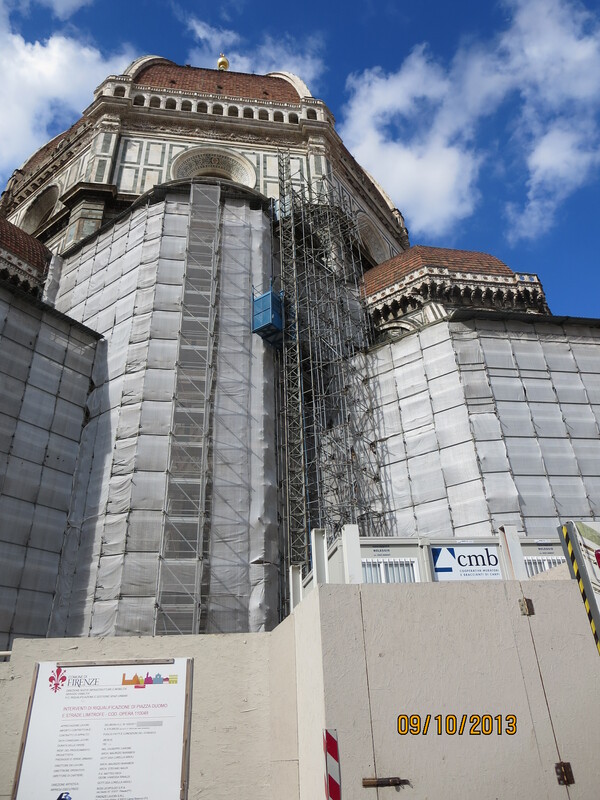 Instead of the Duomo, The Cathedral di Santa Maria del Fiore, I was in The Cathedral di Santa Maria Novella. Oh how easy it is for a woman on her own to become confused. So after I went into the same Cathedral asking for directions to the Crypt and Dome I was told I was in the wrong church. How embarrassing. Undaunted I set out again on foot to find the right church. 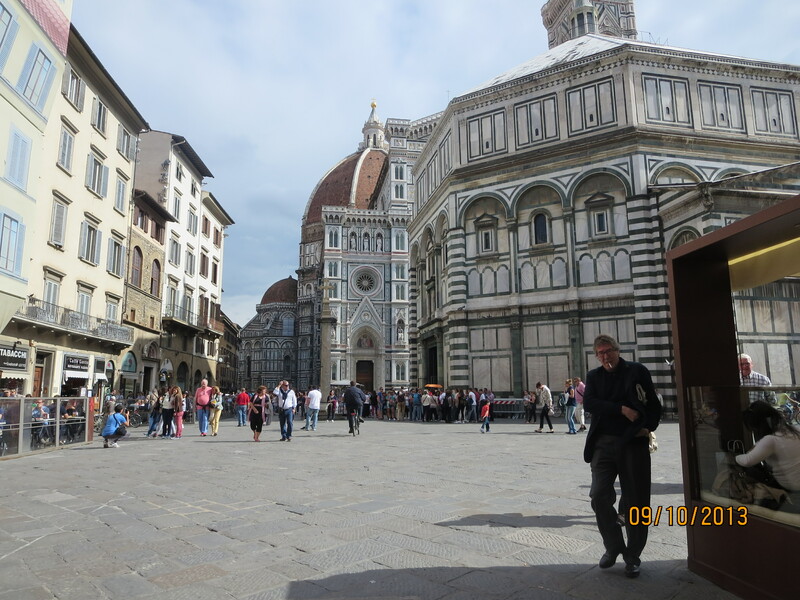 You may wonder how I became confused when the dome towers above Florence – but I did so there! 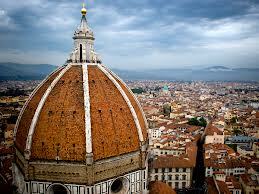 The historical centre of Florence became a World Heritage Site in 2007. 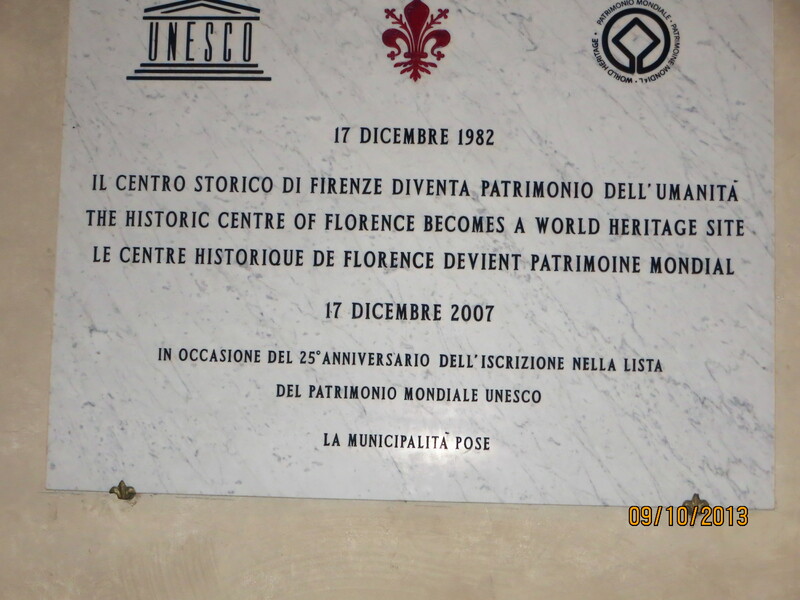 Unfortunately my photography is not good enough to show this plaque. But if you click on the image a larger image appears and you will be able to read the words. Only found that out after I published the post . 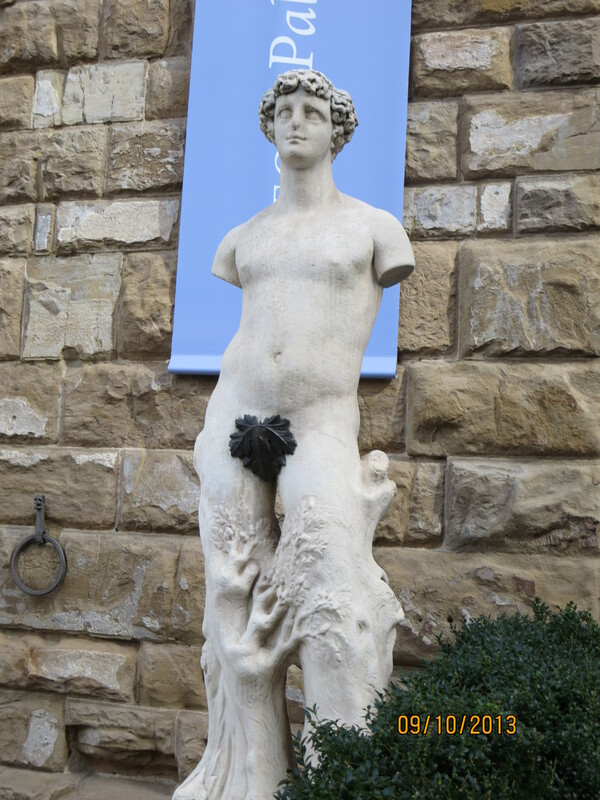 I wandered along the beautiful little lanes of Florence and marvelled at the number of people there. All tourists many with guides but equally as many in small groups. This is not really the tourist season and so I am glad I am here now and not then. Anyway back to my story. I eventually found the right Cathedral and went inside. There was complete silence while the many, many people there gazed in wonder and awe at the works of art. I think it wouldn’t matter how many times you saw these wonders you would never get tired of them. I did go down into the Crypt where Brunelleschi, the architect of the Duomo, is buried. The crypt holds the ruins of the Church of Santa Reparata, the original church on the site. But when I enquired about going up inside the dome the very nice young man in charge asked first if I were “solo?” and then suggested that it would not be a good idea for me to go up the 463 steps to the spiralling dome. I didn’t bother to ask about the Campanile as I was sure to get the same response. Oh well, perhaps when I come back with my partner? Lunch today was not in the same class as yesterday. When I returned to the apartment last night and did the conversion I found that lunch had cost the equivalent of $NZ49/$US40 so I had to rethink lunch today. 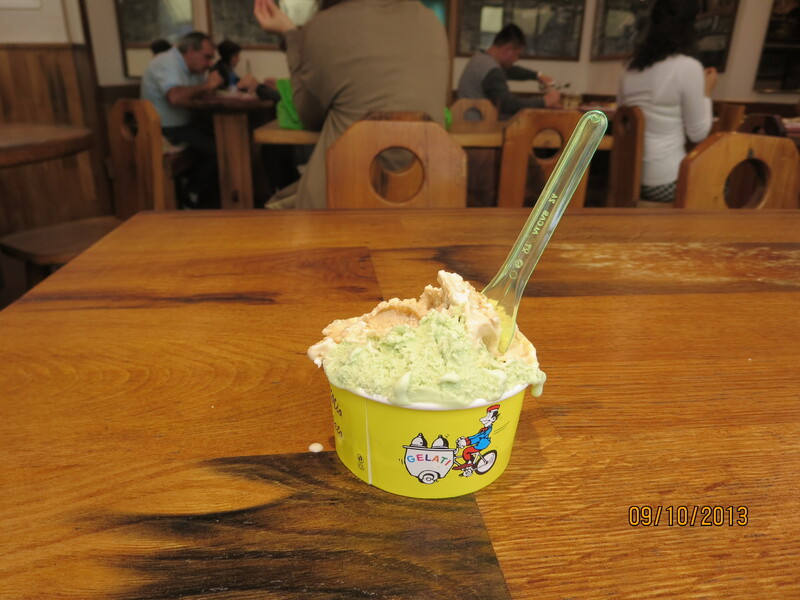 And I chanced upon a lovely little Gelateria where I had a gelato and a sit down all for $NZ4.10/$US4. 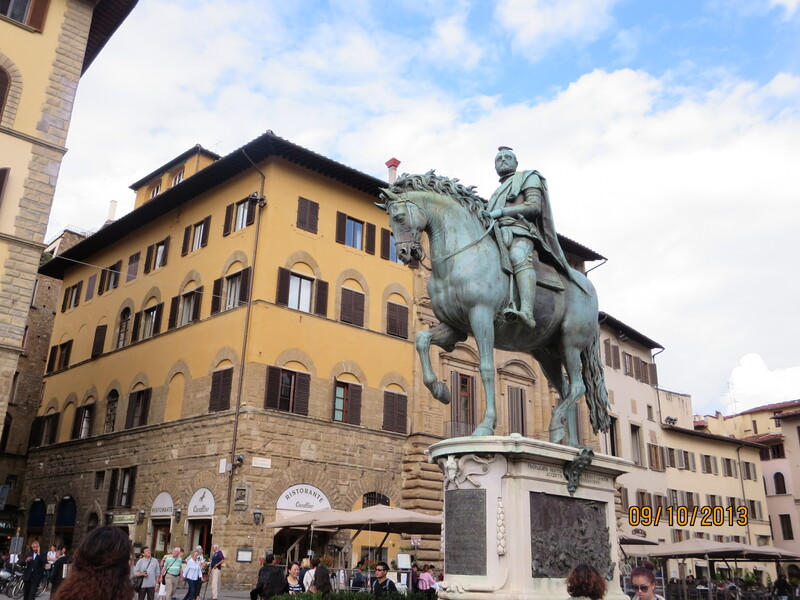 Then back on my feet and off to the Bargello, a former barracks and prison. 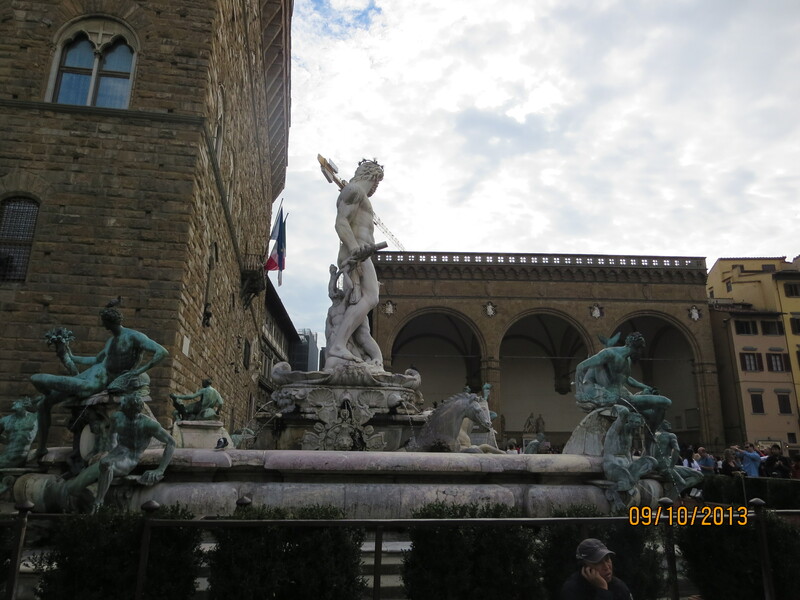 Here is another magnificent art collection including works by Michelangelo, Donatello and Cellini but I shall hae to go back to spend more time amongst this priceless art. And everywhere I turned there was another wonderful thing to see, another street to go down, another square to cross. 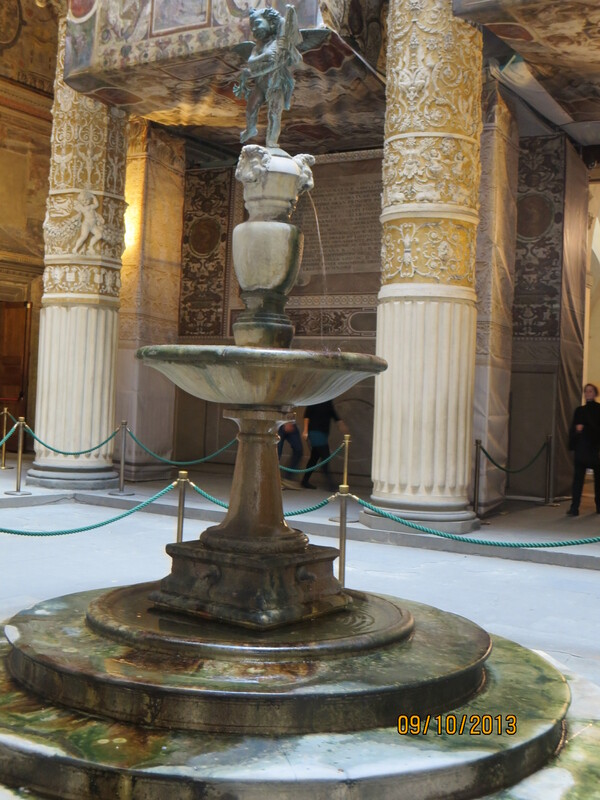 One could spend months here and not even see a tenth of the treasures. The streets are home to many sellers of leather goods, obviously and the streets are also lined with high class shops But I am not here to shop, so apart from buying some jewellery for my daughter and a friend, I resisted the temptation. And then I discovered this pig. I was told that everyone had to pat the pig but nobody seemed to know why. 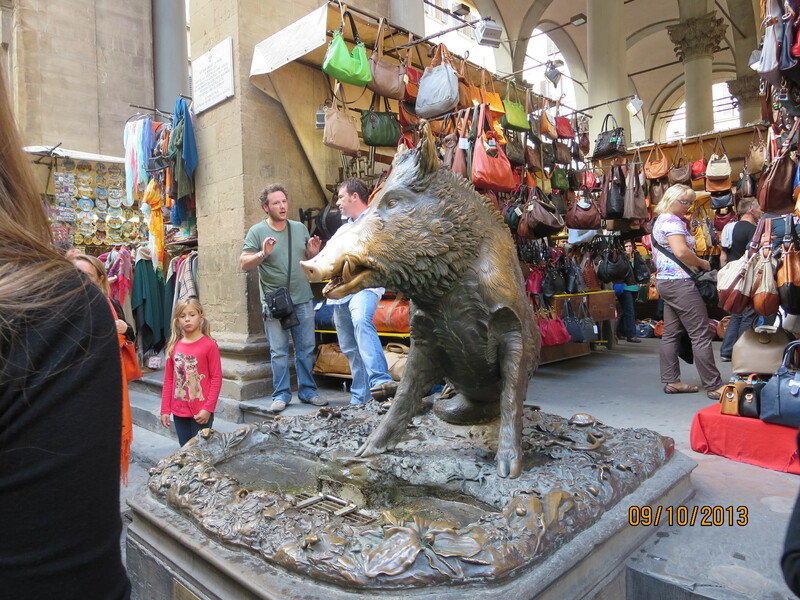 So like a good tourist I patted the pig. So after another full day delighting in the treasures of this Renaissance City I found my way back again to the station to get my bus. If I am honest here I would tell you that I did find myself going past the same shops and entering the same square a few times but that’s part of the fun. And in the event I asked a handsome young policeman “Stazionne?” in answer he gave me directions in Italian with the help of many hand movements. How lovely. I arrived back here at the apartment, sated in beauty, tired and needing a cup of tea. I am English after all. And I have decided that I obviously have not been walking enough recently – my thighs are letting me know that I have walked for about 5 hours each of the last two days. This must get better! And a few more photos for you. So thanks for travelling with me and exploring this fantastic city. I will tell you more tomorrow. My family and most of my friends know that my favourite song is I Hope You Dance. This song sums up my attitude to life and I love it. And I have chosen it to be played at my funeral. Imagine my delight then when I received an email this morning with this video embedded – please watch it. This unbelievable 94-year-old dancing the Foxtrot with a young man. Whatever she has been doing for the past 94 years I want to do – and whatever she is on I want some. 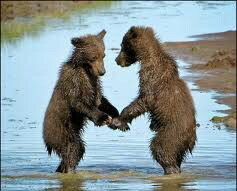 And when you get the choice to sit it out or dance.I hope you dance….I hope you dance. And when you get the choice to sit it out or dance.Dance….I hope you dance. Maybe this is why I can’t dance like Matilda. When we lose somebody we love, certain days take on special meanings for us. Birthdays, anniversaries, Christmas etc all become so much more than just days. These are the days when we don’t want to be with other people and just want to wallow in memories and maybe self-pity. But after many years of this, one suddenly realises that yes these are just days. Today is my Dashing Young Scotsman’s birthday. Had he lived he would be 83 years old. I ask myself how would I feel living with an 83-year-old and answer great. Every year on this day since his sudden death in 1998, I have spent time only with the family. In the beginning the small boys helped bring me out of the “slough of despair” and I was so very grateful to them and their parents. But yesterday I decided that enough was enough. November 1 is just another day and as I remember my DYS every day of the year, I don’t need to make this day any different or any more special. But in the city with its life and vitality. To enjoy friends and family. 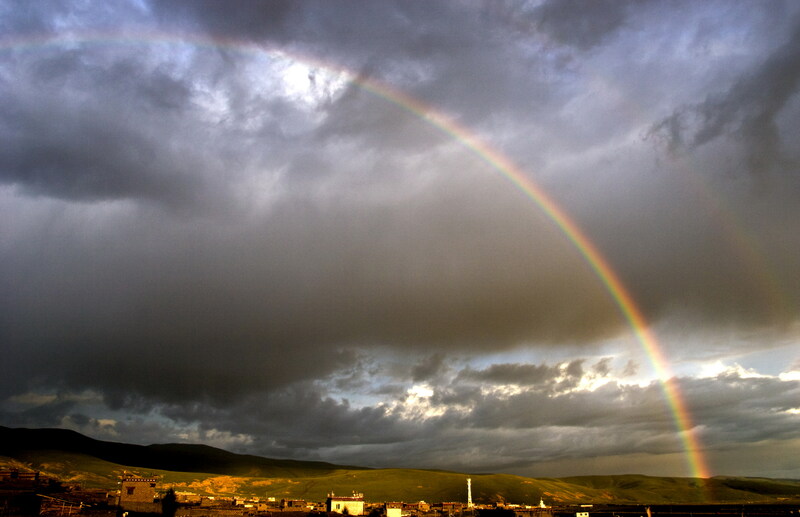 And here’s my rainbow to help those of you battling with the after effects of Sandy. My thoughts are with you all in this dire time. The area in which I now live is a mix of young families, grown up families, single people, professional singles and couples, and retirees like me. The other day my day was made when I arrived home. As I was getting out of the car I heard two little voices calling “Judith, Judith” and there were the two, little girls from across the road calling me to come and talk. These delightful little ones are 4 and 2 years old and I was thrilled that they wanted to speak to me. They showed me the treasures they had gathered that day with the elder one prompting her sister all the time. The treasures were leaves, a couple of flowering weeds, a pebble and a bird’s feather – what innocence they displayed. We ‘chatted’ for some minutes and then I was told by the elder one, that they were waiting for friends who were coming for a sleepover. I was told that one was only a baby and so wouldn’t be playing but her big sister would. I heard that they would stay the night and then go home to their own house the next day. This information was imparted with such seriousness and then when the car carrying the friends arrived, their excitement knew no bounds – I love that expression and it really tells how they were. Jumping up and down and calling their friends’ names. This simple interaction with these two little girls brought me so much pleasure and I thought after I left them that often we look for happiness in the big things, when in fact happiness and pleasures are all around us if we just take the time to look. 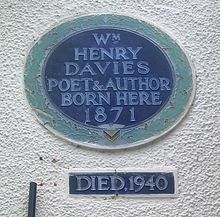 “Leisure” by William Henry Davies, Welsh Poet & writer 1871-1940. So tomorrow take some time just to be and to look around and see the little things that make life worthwhile. Two little girls made by heart sing that day – what makes yours sing? I am constantly amazed at the fortitude of my fellow bloggers. When I read of the hardships and abuse many have suffered and overcome, I wonder at my luck of having been born into a loving and caring family and then having the good fortune to meet and marry my ‘Dashing-Young-Scotsman’ at an early age. I tell people that I have lived a blessed life. If you have read any of my earlier posts, you will see that I had a long and mostly happy life with my DYS; I have two children whom I love and whose support I can rely on and appreciate. My family is rounded out by four strapping young grandsons all of whom seem pleased to see their Granma and offers of help are often forthcoming. Of course, no life is perfect. I left my family in the UK to follow my husband in his move up the corporate ladder which entailed us moving around the world. My children therefore, missed out on the companionship of cousins that I had when growing up. And they saw their grandparents on rare (bi annual) visits home. 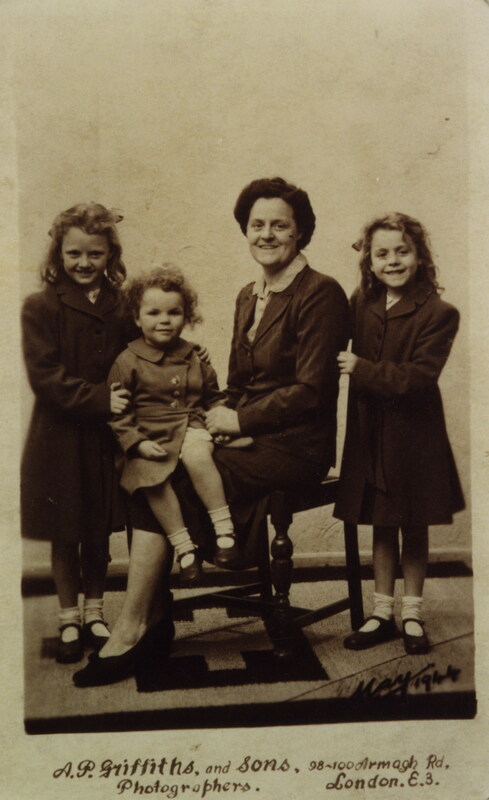 So they were very much part of a nuclear family – the four of us in a world far removed from home. I am also very lucky to have two sisters, one in London and one in Los Angeles. Could we have landed any further apart even had we planned it? While they are not within easy visiting distance we still are in regular contact by phone and now of course, the internet. Aren’t we lucky to live in this technological age. There have of course been bad times in this long life of mine. We lived in Montreal for a couple of years and I absolutely loathed it. The French Separatists were very active and almost daily we heard of their actions against the English speaking population. My children’s school was bombed and that coupled with the police going on strike, made the decision for us to leave and return to our adopted home, New Zealand. This time we knew that it would be a permanent move and that family and friends in the Northern Hemisphere would see us only a rare trips home; but we made the decision in the knowledge that this was where we wanted to raise our children – on the beach in Takapuna, Auckland. After a year my husband was transferred to Wellington, the capital city, but that’s another story. I wrote about a time when I was in danger of losing my leg and a black day when I wanted to Stop the World, but my blackest day was 14 years ago when my Not So DYS died and the colour went out of my world for some time. But living and moving on doesn’t come with a choice and so I am in the next phase of my life and most of the colour has returned. So daily I give thanks for my life and know that I wouldn’t swap it for anyone else’s. Oh yes of course, there are parts I would gladly change. Those that are shared in this post and others but mostly I say thanks to god, the Universe or whatever power is above us for giving me this life. And above all I thank my fellow bloggers for being so open about their lives, in all the ups and downs and for sharing with us how they have overcome. In reading about their problems I have come to realise just how lucky I am. This is their gift to me. Thank you thank you! As each day comes to us refreshed and anew, so does my gratitude renew itself daily. The breaking of the sun over the horizon is my grateful heart dawning upon a blessed world. Today being Thursday, I went to the hospice to help with lunches. This was the first time I had been back since my accident way, way before Christmas. In fact it is now 8 weeks since I was last there. They say time flies when you are having fun…? Anyway, back to lunch time today. Of course, all the people were different to those I had met on my last visit. Many had gone home, some had moved to more permanent residential homes and unfortunately, some had lost their battle and had passed on. I have said so many times that I am amazed at the way most people come to terms with their life ending. Most of them are if not cheerful, at least pleasant to us and grateful for the help they receive at the hospice. The occasional one is still berating all and sundry because his/her life is ending, but these people are in the minority. I am also amazed at the care and attention all patients receive from the staff, however, difficult and cranky that patient may be. The doctors and nursing staff cheerfully undertake their duties in a kindly and caring manner. Each patient is made to feel important and that they are the only person requiring the attention of the staff member at that time. The patience displayed by the staff from the doctors, nurses, orderlies and helpers is truly special. Then this afternoon I went to another medical facility. Annual check up time – mammogram followed by a visit to my ‘breast man’. The delightful, charming, wonderful man who performed the surgery to remove my cancerous lump. I enjoy meeting with him on an annual basis. We discuss our families and what they have been up to in the year since we last met. It’s very social and not at all like a doctor’s visit. After some 15 minutes of chit chat, during which time we have caught up on the fact that his daughter (another Kate) has finished three years of her legal studies and when I first went to him almost 12 years ago, this kid was still at school, he gets around to examining me. So this is quite a bright spot in the day, But the mammogram that precedes this appointment is anything but. The radiographers do try to make this as easy as possible but each year I realise that such a machine could only have been invented by a member of the male gender and I pass the time by imagining which part of his anatomy I would put into the machine. However, the discomfort aside, I encourage my daughter and daughter-in-law, sisters and friends to have regular mammograms. My cancer was not palpable, it was so small, but was picked up in this way. And now I have an apology to make. I was recently awarded a HUG award by the Island Traveler and did not acknowledge this in my post on Awards. Apologies my friend for this oversight. You may only receive this award once. 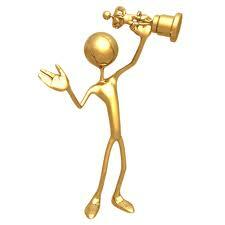 Upon receipt of the award, nominate at least one other person. The award is not time limited, so you can nominate new people or sites you encounter in the future. Contact your nominees and tell them they have been nominated for the award. As part of the acceptance I must nominate at least one person for this award and I nominate Suzicate at the Water Witches Daughter. But also, as I have said so often in the past, I am uncomfortable about picking a few out of the many blogs I read and am inspired by, so once again I direct you to my blogroll. 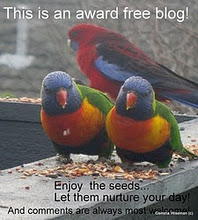 Take a look at each of these blogs. They are certainly worth your time and see how each of them qualifies for a HUG award.